The Recreation Room was once again the venue for the Macmillan Coffee Morning that was held this year on Saturday 27th September. This annual event is held countrywide and Beckingham has been hosting it now for 11 years, organised once again by Marion Brown. Doors opened at 10.30 to a glorious sunny autumnal morning and because of the weather the fund raising stalls extended outside. The Cake Stall would have received applause from the judges of The Great British Bake Off! 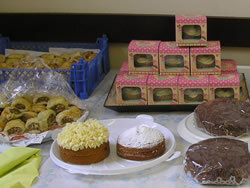 There were beautiful cakes and homemade preserves for sale, all baked and donated by hard working villagers and unsurprisingly all sold out by the end of the day. The tombola was run by Maureen Graham and Val Turtle. This has always been a popular fund raiser. Jo Bruce held a special Children’s Tombola and this year she held it outside in the sunshine – attracting young and old to lots of exciting prizes of toys and games. Brian and Pat Suart sold tickets for the main raffle of the day. All prizes, once again, had been donated and included prizes above and various cosmetic and beauty products, wines and spirits, chocolates and other delicious food items. Other donations appeared on the Bric a Brac stall (‘new to you’) and included books, household items, kitchenalia, cosmetics etc. 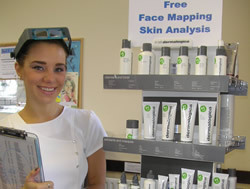 This year Harriet Cooper, who is a beauty therapist and nail technician in the village, offered a free dermatology face mapping service to visitors and had for sale some of her products with leaflets advertising her services. Last but not least, Kath Long and Shirley Wilson served tea, coffee and biscuits with a smile throughout the day. 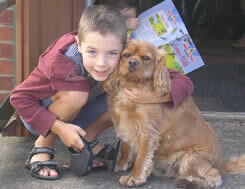 The event finished at approximately 3 o’clock and it was estimated over 200 visitors attended. £974.28 was raised for this worthwhile charity. A big thank you for all those who donated, helped and supported the event as they have done for the past 11 years.